AEW’s GIS Coordinator, Jeff Miller, gave the presentation, followed by a Q&A opportunity. As our firm grows in both our Geographic Information Systems (GIS) services and the communities we serve with the state-of-the-art technology we have available, GIS Coordinator Jeff Miller and his team are sharing their expertise at forums in neighboring communities and inviting our current clients and potential future clients to learn more about the many facets of these rapidly developing applications. 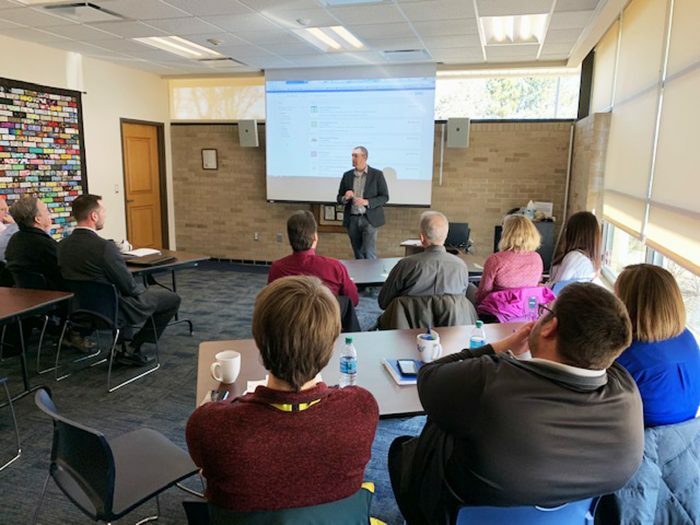 The GIS team has hosted forums at the Roseville-Eastpointe Recreation Authority building and most recently at the Clawson Public Library. The attendance by Public Works and City Administration officials has been strong, and included representatives from Fraser, Grosse Pointe Woods, Roseville, Eastpointe, Clinton Township, Mount Clemens, Birmingham, Clawson, Rochester Hills and Troy. 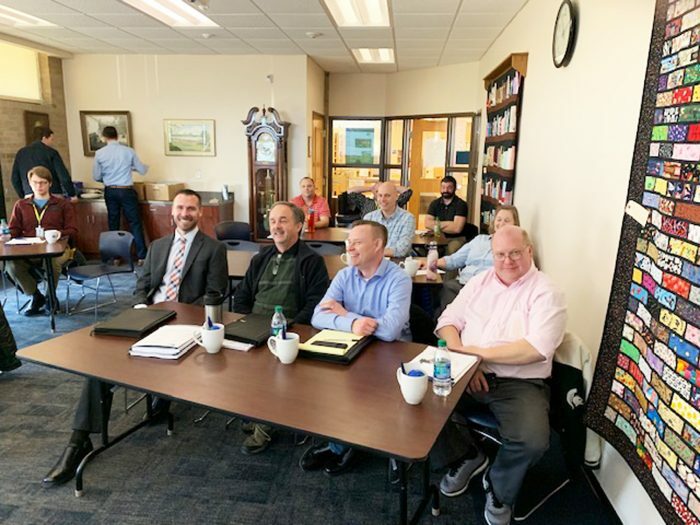 The program was held at the Blair Memorial Library in Clawson, and was attended by officials from the cities of Birmingham, Clawson, Rochester Hills and Troy. Jeff highlights some of the easy-to-configure mobile applications we’ve set up for a number of our clients, and also demonstrates others that we have the capability to put into service for our clients. He also touches on some “tips and tricks” for our in-house portal, along with vGIS applications, an augmented reality application that allows one to virtually see underground. AEW GIS and Surveying departments recently won a valued American Council of Engineering Companies of Michigan (ACEC) “Surveying Honorable Conceptor Award” for our largest GIS project to date for our “Sterling Heights GIS Data Build.” Sterling Heights is Michigan’s fourth largest populated city, and the project included the use of our in-house designed “Surveycycle” that assisted our team in the mapping and building of 1,864 miles of water, storm and sewer lines, and the collection of 72,025 manhole, catch basin, hydrant, and valve points. We’d be pleased to visit with you to learn more about your community and how we may best assist you in bringing basic or more advanced GIS services to each of your stakeholders. Please contact Jeff Miller at (586) 723-1234 or jmmiller@aewinc.com for additional information.